For all the fluids used in the clean operation of your car (that includes air, too), they need to be filtered to ensure that impurities and environmental particulates don’t build up and damage your parts. This page will individually explain why it’s important to have fresh oil, air, and cabin air filters. To schedule filter maintenance for your car, truck, or SUV, please call our Mississauga car dealership service team at 1-888-651-1987 or book online using our handy online form. Our professional technicians are certified to work on all auto brands, not just Kia models. Your fuel filter is responsible—you guessed it—for filtering the gasoline or diesel fuel before it’s injected into the engine combustion chamber. Your fuel filter will need to get replaced when it becomes too full of impurities, which could lead to your fuel system getting choked off and affecting performance, fuel economy, and engine starting. You may also need to swap out your car’s fuel filter if you’ve ran out of gas lately, as a steady flow of fuel ensures it stays lubricated. Your air filter is the first place that incoming oxygen has to pass through before getting combusted inside your engine. An air filter makes sure that smoke, soot, and other particulates don’t clog up your engine and impede power and fuel efficiency. To give you an idea of how much use it gets, for every 9 litres of gas burned, you can expect up 100,000 L of air to pass through that filter. 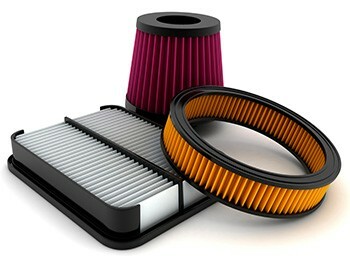 We recommend checking your air filter every time you have your engine oil changed. A feature on most cars built within the last several years, a cabin air filter traps allergens, dust, and other impurities in the outside air from entering your vehicle’s interior. You’re likely to find the cabin air filter in a compartment in the glove box, in a section under the dash, or underneath a cowling strip at the top of the engine bay. If you start to notice that your vents aren’t blowing as hard, there’s a noise when you turn up the fan speed, or there’s an unusual smell coming from the vents, it’s likely that you need to replace your cabin air filter.